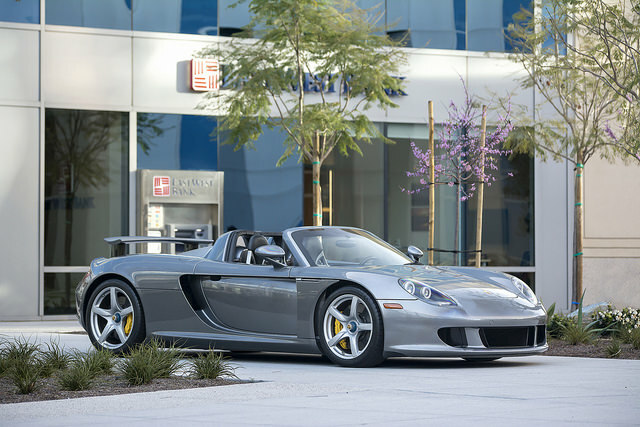 Built to be a fast, beautiful car, the Porsche Carrera GT achieves its goal with ease. Under the good is a 5.7 liter V10 engine producing 612 horsepower and 435 lb-ft of torque. The Carrera GT is a mid engine car, with the engine directly behind the vehicle occupants. What was innovative about this car is the way that its engine is placed: with the use of a clutch made of a high-tech ceramic material, it allowed the engine to sit lower in the chassis than in any other supercar. This feature not only makes the Carrera GT a road car with the looks of a race car, but also improves its aerodynamics and lowers its center of gravity. The Carrera GT lacks any electronic driving aids that are usually found in newer cars, in order to give the vehicle a true race car feel. The top speed of the Carrera GT is 205 mph.